​My research interests broadly revolve around coupled natural-human systems with strong policy or management focus. The motivation for most research topics emerges from key conservation issues. Thus, I am particularly interested in how anthropogenic changes, mainly agriculturally-driven deforestation, alter biodiversity and ecosystem services. I am also interested in evaluating the effectiveness of market-based strategies to reduce deforestation (Fig. 1). ​Fig 1. Integrative model of theoretical processes driving loss of wildlife and ecosystem services and research interests. This model is not an exhaustive representation of all environmental issues; it focuses on environmental conservation problems that I find particularly interesting and urgent. In my research, I combine both intensive and extensive field data with quantitative modeling from the landscape ecology field and economic theory to approach questions. Furthermore, given how complex coupled natural-human systems are, I heavily rely upon collaboration with researchers across different disciplines, such as mathematics and economics. With this approach, collaborators and I aim to understand pressing environmental issues, develop novel analytical techniques, and improve upon existing policy tools to conserve our environmental heritage. In the past, much of my wildlife research has focused on mammals and birds; however, interesting questions motivate me more than taxon-specific problems. Nuñ​ez-Regueiro M.M., Fletcher, R. J. Jr., Siddiqui, S. Global meta-analysis of bioenergy impacts on biodiversity. (in review). Nuñ​ez-Regueiro M.M., Branch, L. C., Hiller, J., Nunez Godoy, C., Siddiqui, S., Volante, J. N., Soto, J. Policy lessons from spatiotemporal enrollment patterns of Payment for Ecosystem Service Programs in Argentina. (in review; preprint here). Lopez-Hoffman, L., Lien, A., Swann, A., Feng, X., Huang, T., Breshears, D., Derbridge, D., Baldwin, E., Lague, M., Nuñ​ez-Regueiro M.M., Soto, J. Where forest die-off matters for agriculture elsewhere: identifying the hidden economic tele couplings caused by ecoclimate teleconnections. (in review). Nuñ​ez-Regueiro M.M., Fletcher, R. J. Jr., Pienaar E. F., Branch, L. C., Volante, J. N., Rifai, S. 2019. Adding the temporal dimension to spatial patterns of PES enrollment in the endangered Chaco Forest. Ecosystem Services (PDF). Marques Santos, P., Bocchiglieri, A.,[...] Nuñ​ez-Regueiro M.M., [...]Ribeiro, M.C., Galleti, M. 2019. Neotropical Xenarthrans: a dataset of occurrence of Xenarthrans species in the Neotropics. Ecology (in press). Rojas Bonzi, V., Eguren, A., Nuñ​ez-Regueiro M.M., Marquez-Garcia, M., Hernandez, F., Clavijo, C., Rodriguez, I. ​2018. Desafios y oportunidades para conectar la investigación y la practica de la conservacion en el Cono Sur de America. Paraquaria Natural (in press). Espin, J., Palmas, S., Carrasco-Rueda, F., Riemer, K., Ungvari-Martin, J, Allen, P., Berkebile, N., Gomez, J. P., Hecht, K., Kastner-Wilcox, K., Nuñez-Regueiro, M. M., Prince, C., Rios, C., Ross, E., Sangha, B., Tyler, T., Villegas-Bilbao, M., Cataldo, T., Bruna, E. M., 2017. A persistent lack of international representation on editorial boards in biology. Plos Biology (in press). Gottlieb, I.G.W., Fletcher,R.J, Jr., Nuñ​ez-Regueiro, M.M., Ober, H., Smith, L., Brosi, B. Alternative biomass strategies for bioenergy: implication for bird communities across the southern United States. Global Change Biology Bioenergy (In press). Trigo, C., Talamo, A., Nuñ​ez-Regueiro, M.M., Derlindati, E., Maras, G., Barchuk, A.H., Palavecino, A. 2017. A woody plant community and tree-cacti associations change with distance to a water source in a dry Chaco forest of Argentina. The Rangeland Journal (in press). Policy tools for environmental grand challenges. Current challenges can be daunting and different policy tools have strengths and weaknesses. Here, we will build a synthetic predictive framework with the BBCS group. Invasive species and institutional analyses. What are the roles of institutions in controlling the spread of invasive species? A research project with the BBCS group. Hidden forest-agriculture teleconnections. Recent work highlights how forests loss can alter climatic conditions in distant locations, but how do these climatic changes affect food production across multiple spatial scales? A research project with the BBCS group. ​Climate change will affect how biodiversity is distributed globally. What does this mean in terms of future biodiversity reserve designs? A research project with the BBCS group. I collaborate with Milton Ribeiro and his research group compiling occurrence and abundance data on Neotropical Xenarthra and invasive species for the Neotropics. A doubly stochastic model of deforestation in the context of large-scale industrial agriculture. In collaboration with J. Hiller and C. Nunez-Godoy. Markov models of deforestation: a review. In collaboration with J. Hiller and C. Nunez-Godoy. Scientific Isolation in a globalised world? Thoughts on collaborative networking for the global south. In collaboration with Gonzalo Rivas and others. International representation bias in editorial boards; in collaboration with Emilio Bruna and others. Satellite images and aerial photograph of forest strips embedded in the agricultural matrix. Chaco Forest, Salta, Argentina. We have submitted our first working paper on Collaborative networks for conservation science and practice in the global south! Also, we have created the first chapter of the Society for Conservation Biology for the Southern Cone of South America...more soon! IUCN partners and I published a new article in the Wild Pig, Peccary and Hippo Specialist Group Newsletter. ​Leus, K., Altrichter, M., Arnaud, D., Camino, M., Giordano, A.J., Campos Krauer, J.M., Brooks, D., Thompson, J., Nunez-Regueiro, M.M. 2016. A vortex population viability analysis model for the Chacoan peccary (Catagonus wagneri). 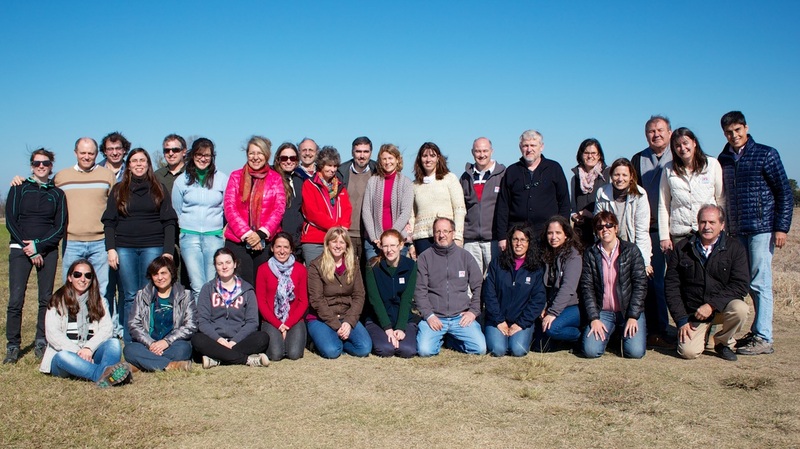 Newsletter of the IUCN / SSC Wild Pig, Peccary and Hippo Specialist Groups (not peered reviewd). Capacity building in Argentina - Jon Dain and I gave a workshop on facilitation, conflict management, and collaboration in Argentina. Funding for this course came from The Rufford Small Grant Foundation, TCD, and INTA. Workshop participants, organizers, Jon Dain, and I on our last day. INTA, Parana, Argentina. Are you interested in knowing more details?